3 Bedroom Terraced House For Sale in Rotherham for Guide Price £40,000. FEATURED IN THE BIG OPEN HOUSE please call for viewing arrangements. For sale by Public Auction on the 01 May 2019 at Double Tree by Hilton, Chesterfield Road South, Sheffield, S8 8BW. A good sized three bedroom mid townhouse which is now vacant, requiring refurbishment and updating but with potential offered. The house will appeal to residential buyers looking for a project, local builders and landlords/investors. The projected renal income once the house has been refurbished as advised by Blundells is iro 450pcm / 5400pa. 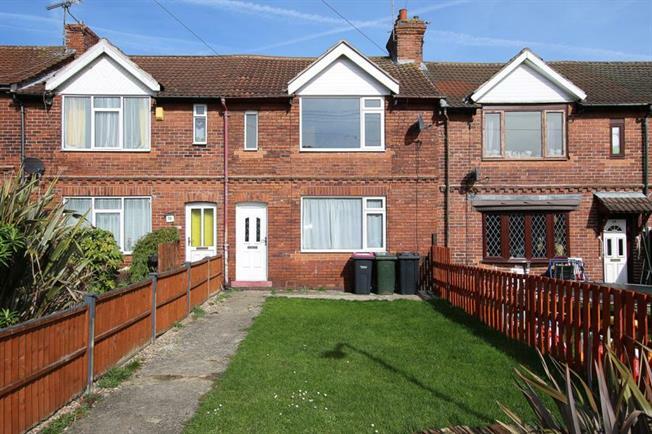 The property has gas central heating, UPVC double glazing and features a long garden to the front which many of the neighbouring houses have converted into driveways (subject to all consents required). Location - The property is within easy reach of schools and within walking distance of local shops, local amenities and bus routes and additional amenities in nearby Wickersley. Rotherham is the closest town offering a wide range of facilities, shops, restaurants, bars, supermarkets and Rotherham General Hospital. The house only a short drive from the M1, M18 and around 30 minutes commute from Sheffield and Doncaster. First Floor - Landing with loft access, three good sized bedrooms. Outside - Long garden to the front which many of the neighbouring houses have converted into driveways (subject to all consents required). To the rear is a yard with brick built outhouse and rear access. Note - For more information connected to securing a mortgage on this property please contact Blundells, our dedicated auction mortgage consultants on 0114 2753853.